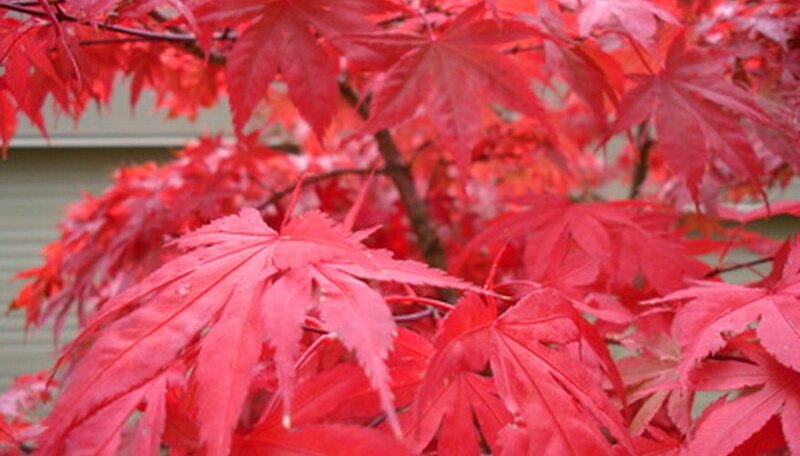 Inaba-shidare Japanese maple (Acer palmatum) is a deciduous shrub or small tree from the Sapindaceae family. Japanese maples are native to Japan, Korea and China, but grow well in USDA hardiness zones 5 to 9. The mature height reaches from 6 to 10 feet with spreads ranging from 8 to 15 feet. Inaba-shidare Japanese maple trees have lace-like leaves first appearing as a dark purple, which change to a purple-red in summer and then a vivid red in autumn. Caring for Japanese maples requires low maintenance. Using a shovel, plant the Inaba-shidare Japanese maple in an area with full sun to partial shade and moist, well-drained soil. Protection from the afternoon sun prevents new foliage from becoming scorched in the summer. Select an area that allows enough room for the tree's mature size. Cover the area around the canopy of newly planted Inaba-shidare Japanese maple with 3 to 4 inches of mulch. Keep the mulch at least 6 inches from the base of the trunk. The mulch is vital in keeping the soil moist and prevents weeds from growing. Reapply mulch or well-rotted compost every year. Supply enough water to the Japanese maple to retain moist soil conditions, but do not let the soil around the tree get soggy. The amount needed varies, depending on location, soil and amount of rainfall. Check the soil below the mulch and water when needed to maintain moist soil. Prune Inaba-shidare Japanese maple trees if you wish to maintain height, as pruning isn't really necessary. However, prune any damaged, broken or diseased branches any time and remove smaller branches crowding (touching or crossing) the center of the tree during the dormant season. Add a balanced fertilizer (as directed on the label) each year in the beginning of spring and reapply in July. Spread the fertilizer around the canopy area of the Japanese maple, but stay clear of the trunk area. Saturate with water to force the fertilizer into the soil.